Writing funeral thank you note after a funeral may be done by an individual or divided among family members. 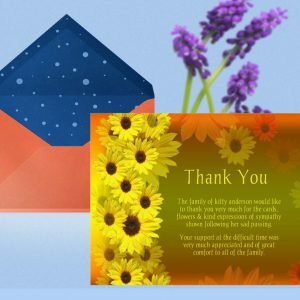 It’s okay to ask a close friend for help writing and mailing funeral thank-you notes and acknowledging expressions of sympathy at and after a funeral. First and most importantly, on behalf of Quick Funeral LLC, we are sincerely sorry for your loss. If we can help, in even the smallest way, to make things easier for you during this difficult time, we are honored to do so. 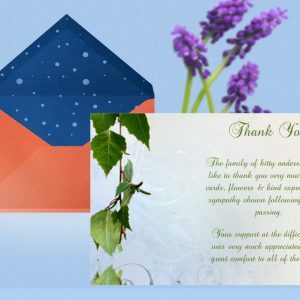 Deciding what to write in a funeral thank-you note is actually easier than it may initially sound. Yes, go ahead, take that sigh of relief. With all that you have going on right now, the last thing you need to worry about is wording the perfect thank-you card message. Keep in mind, those you are writing to care more about your well-being and would not want to be even the slightest source of stress in your life. While it is not necessary or expected to send thank-you notes to everyone who attended the visitation or service, you may still find yourself with a growing list of those you want to thank. Don’t feel obligated to finish the whole stack at once. Simply write what you can, then set aside the rest for when having more time and energy. Also, just a few lines will be sufficient. Be easy on yourself and go at your own pace. 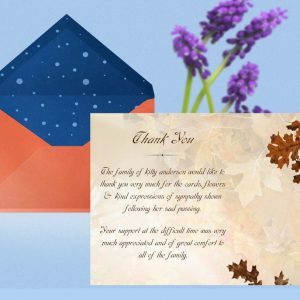 There are many different reasons why you would send a funeral thank-you card—such as thank you for attending the funeral, thank you for the funeral flowers/memorial contribution, thank you for help, meals, cards, etc. And, of course, there are certain, special people who deserve an extra-special message. But since the majority of the thank-you cards will be for attending the funeral, it’s perfectly okay to write similar phrases in each one. No one will be comparing notes. Choosing some of the ideas below, and then adding a personal line or two where appropriate, will help the words flow. A brief note to the celebrant, clergy or spiritual counselor can convey your appreciation for their comforting words and help. Thank you for your spiritual counsel and services at the funeral of my mother. Especially at times like these, your guidance is so appreciated. Thank you for serving as a pallbearer. You are a true friend. Your contributions to the service were a tremendous help. I appreciate your kindness. It is not necessary to send a thank-you to everyone who attended the funeral or visitation. But if you would like to acknowledge someone, a simple thank-you note would be appreciated. It was really nice to see you at my mother’s funeral. I really appreciate the effort you made to travel such a distance. I was grateful to hear your memories, and your support made a difference to me and my family. 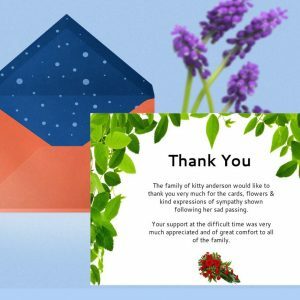 A thank-you note is sent to each person who sends flowers or a memorial contribution. If the flowers or contribution is from a group, send the note to the leader of the group. Thank you for the beautiful pink arrangement of flowers. Roses were Mom’s favorite and they served as a reminder of the special friend you were to her/ how much you and the others meant to her. If relatives and special friends send floral arrangements, a memorial contribution, food or assist in other ways, a thank-you note is an appropriate way to show your appreciation. I want to thank you for the wonderful meal you delivered to our home after the funeral. It was delicious and such a thoughtful gesture. My mother really valued your friendship. Your kindness is greatly appreciated. If a co-worker extends him or herself, it is appropriate to thank that person with a handwritten note. I appreciate your stepping in and covering my work during this difficult time. Thank you for your support. It will make it easier when I return to the office next week. If you receive a sympathy card, it is appropriate to send an acknowledgment card. If a personal note was included in the sympathy card, a brief note should be written inside the thank-you card. If you receive a longer sympathy letter, that should be acknowledged with a personal reply. It was so thoughtful of you to remember us at this time. Thank you for taking the time to share your memories of Mom with us. Your words were such a comfort. Friends like you have helped us get through this difficult time. If you receive a sympathy email, although optional you may reply by email or a handwritten note. Thank you for sending your words of sympathy. It was kind of you to show you care. You may also create funeral programs using funeral templates to save your time for best funeral service preparation. To Start to select a funeral program template to edit and download.